September 7, 2010 - Attorney Daniel J. Horwitz has reported Steven Slater, JetBlue flight attendant, has resigned from the airline and was not fired. 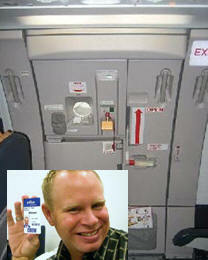 Flight Attendant Steven Slater is no longer employed with the company after he berated and used profane language towards a passenger, grabbed two beers and slid down the aircraft’s emergency chute. On Tuesday Slater was in Queens District Court to face charges. Slater's defense team and the district attorney's office are reportedly in negotiations working out a plea deal that would require Slater to be evaluated by mental health professionals, attend anger management classes and alcohol abuse counseling. Charges against Slater maybe be lowered or dropped. Slater is expected to appear before the court on October 19, 2010. On Monday, August 9th about 11:40 AM, JetBlue’s Flight 1052 was pulling into its gate at JFK when a passenger left her seat, reached into the overhead bin and grabbed her carryon when she was confronted by Slater who informed her to remain seated and wait for the plane to come to a full stop. What was said after that is unclear. However, Slater then got onto the public address system and began to berate the passenger to include the use of profanity. Slater then grabbed two beers, opened the emergency exit door, slid down the aircraft’s emergency chute and got into his car and drove home. JetBlue launched an internal investigation and placed Slater on a leave of absence. Later in the day, Port Authority police officers arrested Slater at his home in Belle Harbor, Queens. Slater was charged with criminal mischief, reckless endangerment and criminal trespass. On Tuesday, August 10th at a bond hearing Slater pled innocent and was bonded out $2,500. Slater’s behavior was at minimum inappropriate but more importantly it has sent out a clear message that there is undoubtedly a problem which is forcing flight attendants to engage in behaviors that put the public at risk and jeopardizes employment.Never in aviation history have flight attendants been subjected to the workloads and expectations than what they are faced with today. It is no wonder that Slater went off. There are those who call him a hero, but the reality is Slater is no hero just a victim of corporate greed. Flight attendants are asked to do too much and are paid a minimum wage, barely enough to make ends meet (Kirsten Arianejad was fired for saying she qualifies for food stamps). It’s becoming a common place for passengers and flight attendants to get into shouting matches and passengers being arrested. Now we are seeing flight attendants getting arrested. It used to be that passengers viewed traveling by air as a special event. Getting all dressed up, family members seeing the passenger off and being greeted by flight attendants as you boarded the aircraft. You were treated like royalty and you claimed an airline as the best carrier to fly. Today the traveling public dreads a flight, which means taking your shoes off, pulling everything out of your pockets, passing through radioactive scanners and being stared at as if you are the next shoe bomber. You take your seat and wait for boarding instructions. Apprehension further sets in, will you be bumped, is there going to be a problem with my carry-on, is this one of the airlines that was recently cited for poor maintenance on their aircraft, etc. You speak with a ticket counter person at the gate who clearly is having a bad day and state a question. The response does not meet your needs, but you know better than to pursue with a comment or ask another question fearing you may be bumped and at worse arrested. You now board the aircraft and as you walk to your seat you notice nothing but unhappy faces, conditioned, you try to pick out the next shoe bomber. You are then overloaded with instructions and now the fun begins. At 35,000 feet, your flight attendant, overwhelmed with trying to pay his or her bills on time, just finding out their child is in need of an operation, that the airline is going to cut back on the amount of hours the flight attendant can work, and is expected to do the work of two, is confronted by a passenger for some orange juice. The flight attendant begins to have a nervous breakdown and heads for the exit door.